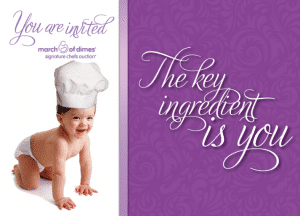 Monday, October 15, 2018 is the annual Signature Chefs Auction to benefit the March of Dimes. The event is scheduled to begin at 6:00 p.m. at the Charleston, WV Marriot. Please, Click here to secure your tickets. For more information, please contact Joanna McNurlin at 606-939-6338 or jmcnurlin@marchofdimes.org.